Look at this! It’s very impressive! 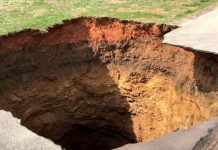 A massive growing sinkhole, which runs along a fault-line at a Tumunui farm, is about 200 metres long, 20 metres wide and 20 metres deep. The huge crater opened up after record rains fell on New Zealand this weekend. 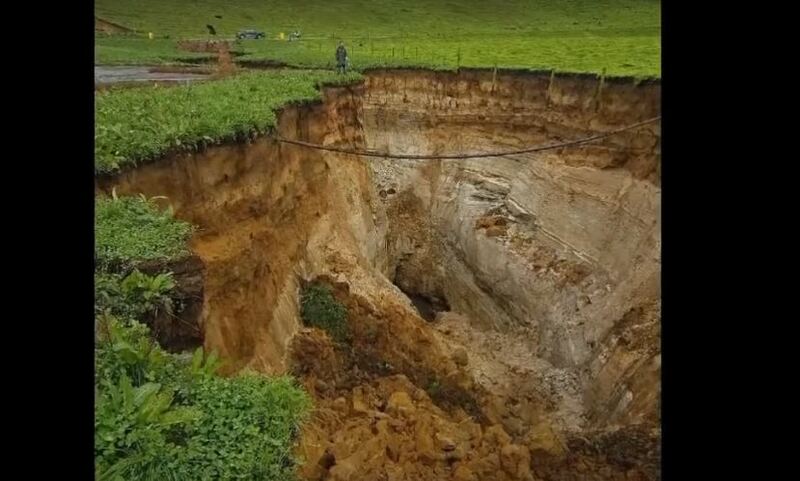 A giant sinkhole has opened up on a farm near Rotorua following Sunday’s record breaking rainfall in the region. The sinkhole, or tomo, was about 200 metres long, 30m wide and 20m deep. 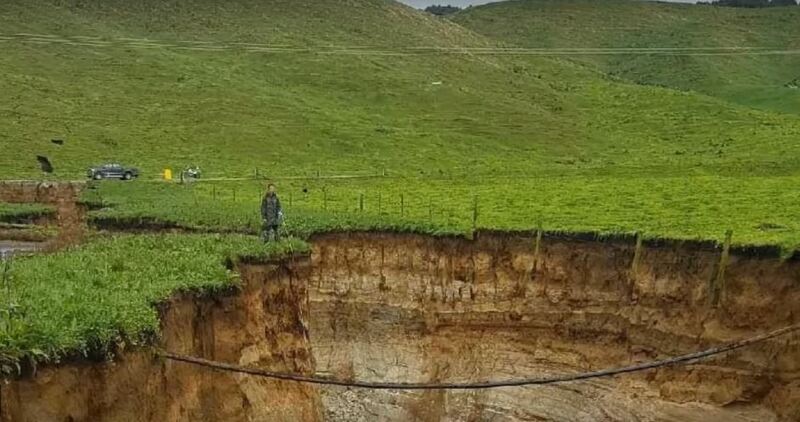 A giant sinkhole opened up along a fault line in a farm near Rotorua, New Zealand on April 29, 2018. 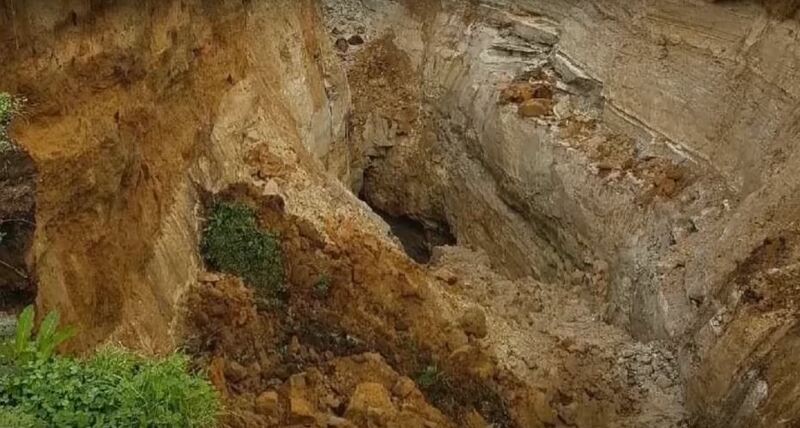 It runs along a fault-line at the Tumunui farm and was discovered by one of the farm’s staff, who went out to get the cows first thing on Monday morning. It’s the ninth serious cave-in that has been on the farm that was at least 10m deep. The huge crater is 20o meters long, 20 meters wide and 20 meters deep. At the bottom of the cavity there is a large hole where water disappears underground. 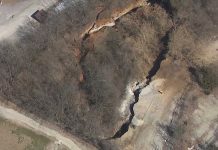 The giant sinkhole could get even bigger because there was already a crack which extended 400 to 500 metres through the property. 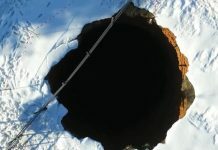 The huge sinkhole is growing every day and a 400-500 meters crack has already been found by the farmers. A look into the abyss! The farm had 146 millimetres of rain over a 24 hour period on Sunday. According to NIWA, Rotorua had its wettest hour on record with 51.8mm of rain falling between 10am and 11am on Sunday, with a total of 167.8mm of rain falling between 4am on Saturday and 6pm on Sunday. 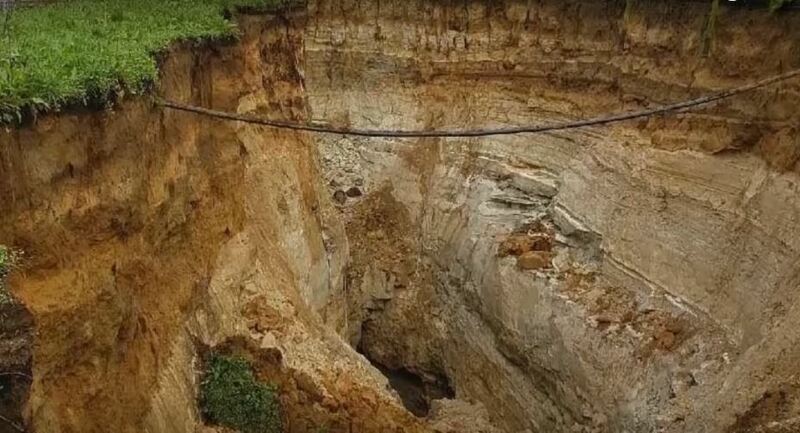 Well this abyssal sinkhole is not as big as the fissures in Kenya, but this growing earth crack could also damage crops and swallow a few cows or sheep. On today’s Intellicast radar, there is FIRE mark in the middle of Gulf of Mexico just south of New Orleans. There is fire going on in the middle of the sea? It must be a fire on the reptilian secret undersea base. It looks like the cleaning up operation on the reptilian secret bases by Galactic Federation of Light is gearing up. On that radar, you can see many spaceships surrounding the FIRE area. It is very impressive to sea the huge flood around Middle East including Israel. Why this kind of loud trumpet noise is happening all over the world? Galactic Federation of Light is letting people know the world is going to be changed by this noise? Or they are arranging the change on the Earth by using some sounds (=vibration)? Do you remember that some gigantic ancient structure such as pyramids were made by making some noise or vibration in order to move many huge rocks upward or downward. They have this kind of technologies. But anyway, it is not a pleasant noise. On the lightning #9 on above video, you can see the lightning was hitting exact location on that skyscraper in New York. I tell you that all the lightnings since 2011, the year Galactic Federation of Light has started cleaning up operation had been all Direct Energy Weapon looked like lightning. look the clouds on this video. Some of them are revealing that spaceships are there to strike the weapon. It is really precise. I myself witnessed when I was in Tampa, FL that the Direct Energy Weapon looked like lightning had been hitting the same building many times for at least 15 minutes or so. In side of that building, there should had been the evil creatures drinking the blood squeezed from human kids, or human meat BBQ party going on.